The decrepigrams shown here were produced by heating 0.3 to 1.0 gm of crushed, sieved sample at a constant rate of 20o C per minute. The pressure pulses produced as the fluid inclusions burst were detected, processed , counted and summed over 10o C temperature intervals. The 4 graphs shown here illustrate the range of behaviour of quartz samples. 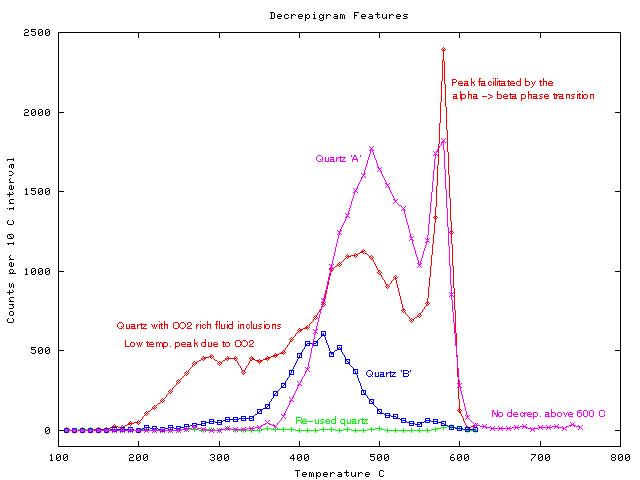 Ordinary quartz 'A' begins to decrepitate at 350-400o C and only shows 2 peaks, one frequently being at 580o C. Between 580 and 800o C quartz does not decrepitate at all, as seen on the graph up to 750o C. The peak at 580o C is related to but not caused by the alpha to beta phase transition of quartz at 573o C. At this temperature the Young's modulus of quartz decreases dramatically. This weakening of the quartz crystal strength enables the decrepitation of any fluid inclusions still present. When the same quartz sample is heated twice, the second analysis gives no counts above instrumental background (see the re-used quartz graph). The absence of any peak at 580o C on many quartz samples (such as quartz 'B' shown) and on re-used quartz confirms that the counts are not caused by the phase transition alone. The process causing the counts is clearly irreversible and not due to physical or thermal expansion effects. There has been an assertion that this decrepitation peak is due to annealing of Dauphine twins in the quartz. However sounds from this annealing process cannot be detected in this instrument as they are shear waves and the instrument ONLY detects pressure pulses transmitted through an air column, which cannot transmit shear waves. Secondary inclusions do not give rise to decrepitation and most quartz shows no decrepitation below about 350o C despite the abundance of secondary inclusions below this temperature. This is considered to be because the secondary inclusions generate only extremely weak pressure pulses which are below the instrumental detection limit. Note the lack of low temperature decrepitation on both quartz A and B samples. When quartz decrepitates at low temperatures it is due to the presence of CO2 rich fluid inclusions, which decrepitate at low temperatures because of their commonly high internal pressures and the linear increase of pressure with temperature during heating. Confirmation of this was provided in research by Mavrogenes et al. (1995) and by Gaboury using mass spectrometric analyses of gases released during thermal decrepitation of quartz. The decrepitation peaks between 350 and 550o C are probably related to primary inclusion decrepitation. These peaks are at higher temperatures than the actual homogenization temperatures by some 100o C but have, in several cases, been systematically correlated with homogenization temperatures of primary inclusions. However, most decrepitation data is used for rapid sample classification and discrimination rather than the determination of homogenization or formation temperatures, because absolute temperatures are not useful in mineral exploration. Knowledge of precise absolute temperatures of formation is only useful in genetic studies of ore deposits after they have already been found. Decrepitation depends on the host mineral strength - its Young's modulus. 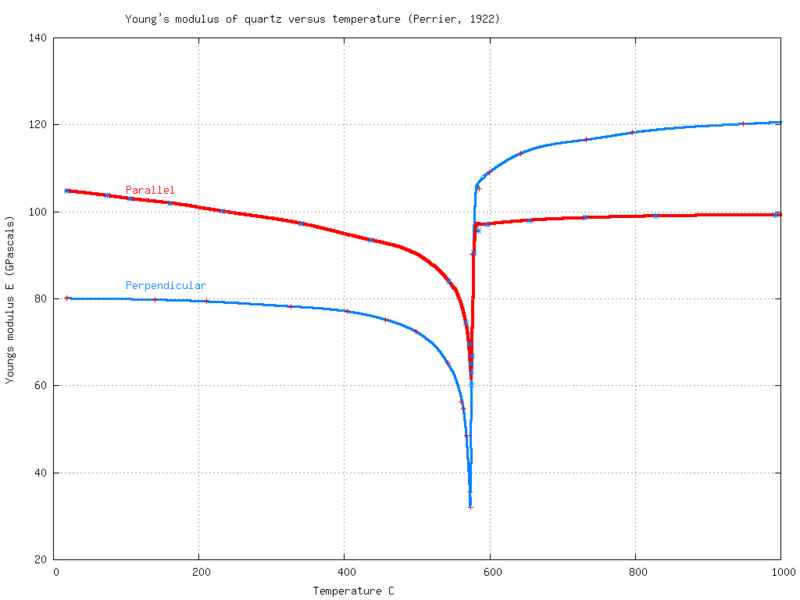 The variation of Young's modulus of quartz with temperature shows a dramatic decrease in strength at the alpha-beta phase transition temperature (573 C). This weakening of the quartz enables the decrepitation of inclusions which were unable to overcome the normal crystal strength of the quartz and gives rise to the prominent decrepitation peak at this phase transition temperature. The decrepitation of fluid inclusions depends upon their internal pressure, size, shape, distance from a surface or plane of weakness and on the strength of the host mineral. When quartz is heated it undergoes a crystal re-structuring at 573 C, changing from the alpha to the beta crystalline form. This change is reversible and essentially instantaneous with no metastability. As the quartz is heated and approaches 573 C, the strength of the quartz decreases dramatically, and inclusions which might have been unable to generate enough internal pressure to decrepitate the quartz may now be able to do so as the quartz changes crystal phase, because of the very low strength of the quartz during this phase transition at 573 C. The observation of decrepitation at this temperature is merely a function of the quartz weakening and does not imply that the fluids were actually near this temperature when the fluid inclusions were formed. Perpendicular and parallel refer to the strength measured in a direction relative to the c axis of the quartz crystal structure.